Richard M. Lerner is the Bergstrom Chair in Applied Developmental Science and the Director of the Institute for Applied Research in Youth Development in the Eliot-Pearson Department of Child Development at Tufts University. A developmental psychologist, he has been a fellow at the Center for Advanced Study in the Behavioral Sciences and is a fellow of the American Association for the Advancement of Science, the American Psychological Association, and the American Psychological Society. Lerner is the author or editor of 65 books and more than 450 scholarly articles and chapters. Dr. Willis (Bill) F. Overton is the Thaddeus Lincoln Bolton Professor of Psychology at Temple University in Philadelphia, PA. Dr. Overton has been Editor of Monographs of the Society for Research in Child Development; Associate Editor of Developmental Psychology, and board member of many developmental and cognitive-developmental journals. Preface (Richard M. Lerner, Tufts University). 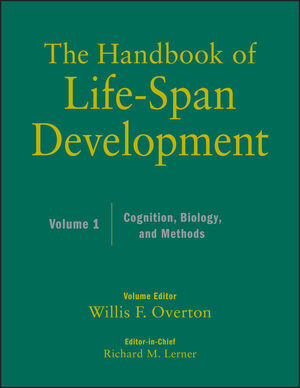 1 Life Span: Concepts and Issues (Willis F. Overton, Temple University). 2 Emphasizing Intraindividual Variability in the Study of Development Over the Life Span (John R. Nesselroade, The University of Virginia; Peter C. M. Molenaar, The Pennsylvania State University). 3 What Life-Span Data Do We Really Need? (John J. McArdle, University of Southern California). 4 Brain Development: An Overview (Philip David Zelazo and Wendy S. C. Lee, University Minnesota). 5 Biology, Evolution and Psychological Development (Gary Greenberg, Wichita State University; Ty Partridge, Wayne State University). 6 The Dynamic Development of Thinking, Feeling and Acting Over the Life Span (Michael F. Mascalo, Merrimack College; Kurt W. Fischer, Harvard University). 7 Structure and Process in Life-Span Cognitive Development (Ellen Bialystok, York University, Fergus I. M. Craik, Rotman Research Institute). 8 Fluid Cognitive Abilities and General Intelligence: A Life-Span Neuroscience Perspective (Clancy Blair, New York University). 9 Memory Development Across the Life Span (Peter A. Ornstein, University of North Carolina; Leah L. Light, Pitzer College). 10 The Development of Mental Processing (Andreas Demetriou, University of Cyprus; Antigoni Mouyi, Pedagogical Institute of Cyprus; George Spanoudis, University of Cyprus). 11 The Development of Representation and Concepts (Ulrich Müller, University of Victoria; Timothy P. Racine, Simon Fraser University). 12 Development of Deductive Reasoning Across the Life Span (Robert B. Ricco, California State University at San Bernardino). 13 Development of Executive Function Across the Life Span (Sophie Jacques, Dalhousie University; Stuart Marcovitch, University of North Carolina at Greensboro). 14 Language Development (Brian MacWhinney, Carnegie Mellon University). 15 Self-Regulation: The Integration of Cognition and Emotion (Megan M. McClelland, Oregon State University; Claire Cameron Ponitz, University of Virginia; Emily E. Messersmith, University of North Carolina at Chapel Hill; Shauna Tominey, Oregon State University). 16 The Development of Morality: Reasoning, Emotions, and Resistance (Elliot Turiel, University of California, Berkeley). 17 The Development of Social Understanding: A Relational Perspective (Jeremy I. M. Carpendale, Simon Fraser University; Charlie Lewis, Lancaster University). 18 The Emergence of Consciousness and Its Role in Human Development (Michael Lewis, UMDNJ—Robert Wood Johnson Medical School). 19 The Development of Knowing (Michael J. Chandler and Susan A. J. Birch, The University of British Columbia). 20 Spatial Development (Marina Vasilyeva, Boston College; Stella F. Lourenco, Emory University). 21 Gesturing Across the Life Span (Susan Goldin-Meadow, University of Chicago; Jana M. Iverson, University of Pittsburgh). 22 Developmental Psychopathology – Self, Embodiment, Meaning: A Holistic-Systems Perspective (Sebastiano Santostefano, Private Practice, Boston, MA). 23 The Meaning of Wisdom and Its Development Throughout Life (Tzur M. Karelitz, Education Development Center, Inc., Newton, MA; Linda Jarvin and Robert J. Sternberg, Tufts University). 24 Thriving Across the Life Span (Matthew J. Bundick, William Damon and David S. Yeager, Stanford University; Pamela Ebstyne King, Fuller Theological Seminary).